Amelia Wright was born on 22nd September 1852 at 75 Greenfield Street, Upper Mile End Old Town. On the birth registration John Wright a Gunsmith signed with a X. Her mother is given as Amelia Wright formerly Cannon. 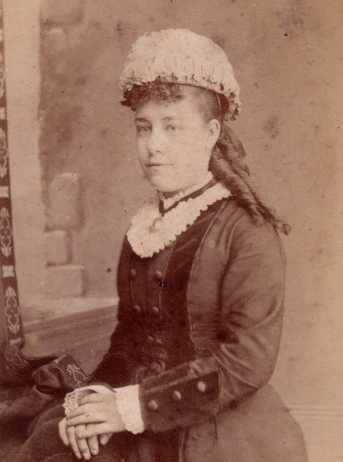 She had a daughter Almira/Elmina Wright-Clarke (1872-??) who was brought up in the family of her grand-parents. Amelia Wright married James Rigg on 16 May 1875 at St Peter Stepney. His father was described as a Tailor, and her father as a Gun maker. The witnesses were Charles Wright and Sarah Wright. In the 1841 census a record has yet to be positively identified. She died a widow aged 72 on 5th October 1925 at 18 Bermuda Street. The death was certified by her daughter Elmina Clarke (née Wright) of 26 Exmouth Street Mile End Old Town, who was present at the death. Her parents were John Wright (1828-??) and Amelia Cannon-Wright (1826-1901+) who were married on 23rd April 1848 at At Andrews Enfield [1848Q2 Edmonton Vol:III, Page: 109].